Better Together Series: Warm up to a seasonal favorite made with harvest veggies and three delicious cheeses. 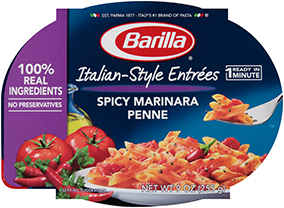 Preheat oven to 400° F. Bring a large pot of water to a boil; cook pasta 3 minutes less than the package directions. Meanwhile in a 12 inch skillet heat cream, marinara and corn to a simmer. Season with salt and pepper. Add cooked pasta and turn the heat off. Stir in mozzarella and cheddar cheese until the sauce is thick and gooey. On a parchment-lined sheet tray, arrange the 8 zucchini boats. Fill each one with an equal amount of pasta and Gruyere cheese. Bake for 30 minutes or until the pasta and cheese has browned and the zucchini are cooked through. Remove from the oven and garnish with green onions.